In a large bowl combine the first 8 ingredients. In a small bowl, whisk together the white wine vinegar, lemon juice, olive oil, oregano, dill, 1 teaspoon salt and 1/2 teaspoon black pepper. Pour dressing over salad and toss well to combine. 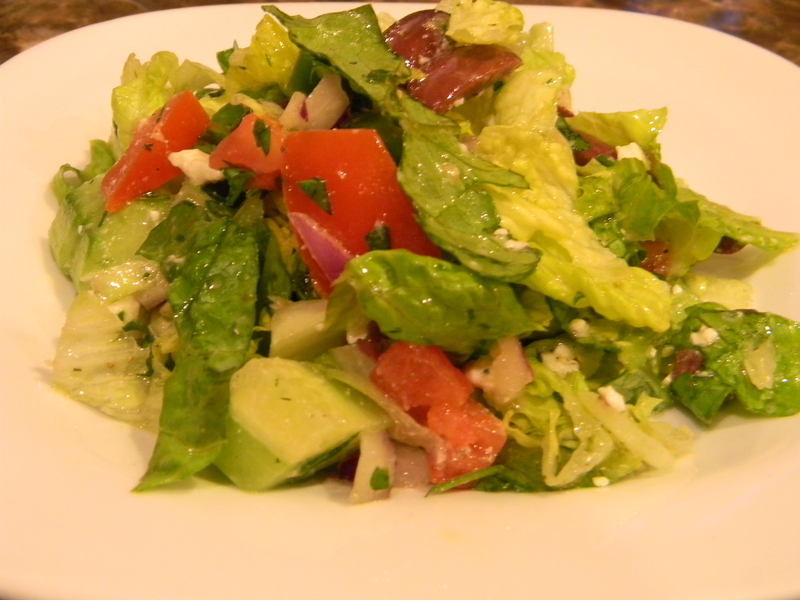 Make sure to dress the salad just before serving or it will wilt the lettuce. We were invited to our friend’s house for dinner last year and she had this incredible water. It was refreshing, wonderful, and I have been obsessed with it ever since. Thank God she told me what was in it. This calls for orange blossom water, which can be found in most middle eastern markets, but you don’t have to use it. If you can’t find it, just throw in some more sliced oranges. Same effect. The possibilities are endless on this: melon-cucumber, basil with berries, lemon-blueberry-mint. This is a beautiful presentation for a shower or party or just to fill up your water jar to drink at work. 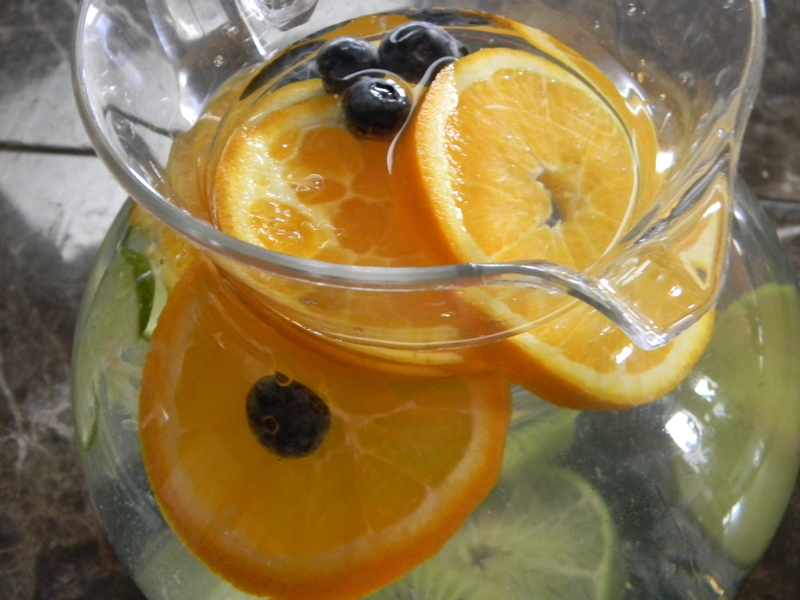 I promise you will drink more water by making this! This is a super simple dinner. I am sure all of the ingredients for the salad don’t sound terribly easy to find, but most of them are in your grocery store. If you don’t feel like assembling the dressing, take a cheat and buy a Soyaki type dressing/marinade and put it over the noodles instead. 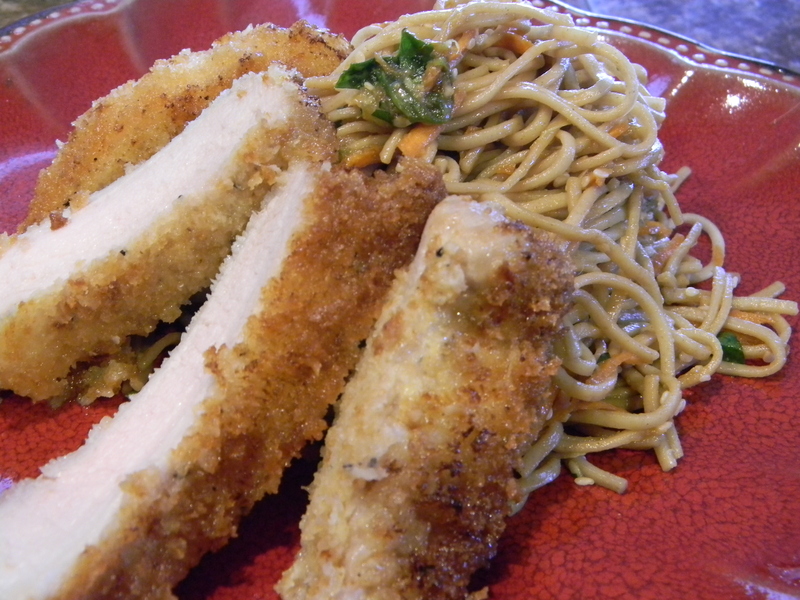 This dish can be made vegetarian by omitting the pork (obviously) and adding a grilled or breaded portobello mushroom. A little tip for de-seeding your cucumbers: cut them in half lengthwise, using a small teaspoon, simply scrape the seeds out. In a large saute pan, heat 6 tablespoons oil over medium heat. Place panko in a shallow dish, and season with salt and pepper. Pour the beaten eggs into a separate shallow dish. Season the pork chops on both sides with salt and pepper. When the oil is hot, dip one chop at a time in the egg then the bread crumbs. Working in batches, add the pork to the hot pan and saute for 3-4 minutes per side, adding more oil as needed. Remove to a paper towel lined plate to drain any excess oil. Let cool 5 minutes, slice thinly and serve over top the soba salad. Place the cooled soba noodles in a large bowl. Add the carrots, cucumber, onion, cilantro, and sesame seeds to the noodles. In a separate small, microwave safe bowl, add peanut butter and heat for 20-30 seconds until thinned. Let cool for a minute or so and whisk in the sesame oil, Sriacha, garlic, ginger, soy sauce, honey, and vinegar until smooth. Pour dressing over noodles, toss all ingredients well and refrigerate until ready to use.